Advance Adapters designs, engineers , and manufactures unsurpassed Powertrain and 4-Wheel-Drive after market products. 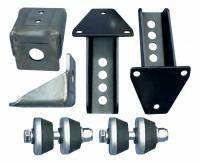 Check out the Recently Listed Flexplates and Components. PitStopUSA.com offers a variety of Shifter Installation Kits from the biggest brands in drag racing. At Advance Adapters Inc., we design, engineer , and manufacture unsurpassed Powertrain and 4-Wheel-Drive after market products. Our award-winning history of innovation and expertise ensures we provide quality craftsmanship as we serve our customers with knowledge and integrity. The humble beginning of Advance Adapters started in 1971. Located in an alley off Woodruff Boulevard in Downey, CA., the business started with a single adapter mating a Muncie car 4-speed to a Jeep Dana 18 transfer case. The popularity of this kit grew, and Advance Adapters soon found itself venturing into a variety of vehicles and adapters. As the product line grew, so did the facility. We soon found ourselves occupying a store front located directly on Woodruff Blvd. 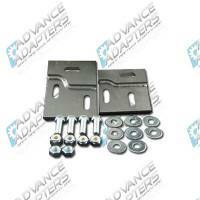 In these early days, Advance Adapters also carried a full line of 4WD aftermarket accessories. This furthered the growth of the company and exposed us to the ever-growing need for additional adapting components. We soon found ourselves outgrowing the limited square footage for both the adapter machine shop and the retail store front. Another move was on the horizon. Talc Street in Santa Fe Springs, CA., offered the ideal setup to facilitate our growth; however, this location was not conducive to walk-in clientele. Nevertheless, the business had grown to the point where telephone & mail order sales were becoming popular. This facility also afforded us the space to venture into the manufacturing of additional components to compliment the already established adapter business. 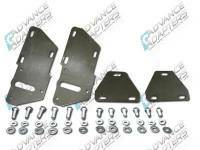 Headers, motor mounts, overdrives, and linkage brackets now became part of the Advance Adapters product line. In 1977, we decided it was time to move out of Los Angeles. So we picked-up and moved north, about 250 miles, to the small town of Paso Robles on the Central Coast of California. We purchased 3 acres and soon began the construction phase of our new facility on the corner of Commerce Way & Santa Bella. 1645 Commerce Way was born, and for the next 15 years was home for Advance Adapters. We started out occupying 10,000 sq.ft. of machining & warehouse with a 2,000 sq.ft. detached office, then added another 12,500 sq.ft. of warehouse space in 1984. This extra square footage was to house the winch business (Sidewinder Winch) that we purchased. 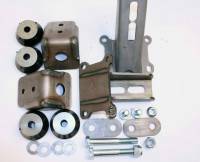 In 1989, we realized that the winch business was more than we could handle alongside the heavy growing popularity of the adapter business. We sold this product line and decided to down-size and just do what we do best - adapters. With 1 acre remaining from the original 3 acre lot, our next building was erected on 335 Santa Bella. We designed & moved into this 18,000 sq.ft. facility in 1992 (which was directly behind the Commerce Way building). Even with the addition of the Saturn Overdrive (old Warn overdrive unit) in 1991, the slightly smaller square footage seemed to be sufficient since the office and warehouse were better designed than the first. In late 1995, the 4WD industry took a turn toward rock crawling. Our product line offered many options for good, low ratio transmission swaps; however, the avid 4-wheeler was looking for more. Thus, we ventured into the ultra-low gear transfer case business (the Atlas Transfer Case). This product line was well received, forcing us out of this facility in only 6 years. One more move was required. In 1998, a new facility was designed & built in one of the newest industrial parks in Paso Robles. Located by the current Paso Robles Airport, 4320 Aerotech Center Way is home today. This nearly 44,000 sq.ft. facility houses all production, fabrication & administration. We have one of the most modern machining & manufacturing facilities found on the Central Coast. The Aerotech facility offers us the best possible avenue to maintain customer service with the highest quality of products!